Spring has sprung, finally and tax season is now over and I can almost return to normal life, well as normal as it gets when you are training for an Ironman. Just to put my life into context, I have a full time job as CFO for a communications company I co-own and for the last 10 years I have had a bookkeeping and tax business that I still have, I have a marathon on Sunday and an Ironman in August just to keep life interesting. It has been a crazy few weeks..OK months but I have done pretty well. I had a 30K race at the end of March, I ran the first half exactly as planned but the second half fell apart because I had the flu. 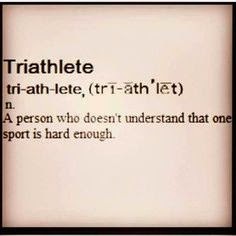 Before anyone tells me off, I know running with the flu is not smart...and some would say doing an Ironman is not smart as well, it seems to be a common thread in my life these days. Another not smart thing I did was to ignore a nagging hamstring issue, I mean really it was only bothering me since July and it was now March...whats the rush...right. I finally went off to the Physio to get assessed and it turns out my glute muscles were not firing properly, especially the left one and the hamstring was carrying the whole load and not happy about it. Anyway, fast forward to today and my right glute muscle is back to 100% and the left is at 80% and getting stronger every day. I am off to run my 4th marathon on Sunday and I am hoping, no planning for a good run. Once this is over, I am back to one full time job and training for the Ironman, it should be doable...I hope.